New iMacs, MacBooks Coming Soon? "Upgrading to a new dot release of Mac OS X is almost a no-brainer. The dot releases typically offer better security, more stability and - maybe - a few new features. Apple's record of high quality dot releases means that for most users when Software Update says there are updates, you do. "But Snow Leopard isn't like that. Under the hood it is a very different beast than the Leopard version of Mac OS 10. If you make money with your Mac, make haste slowly...."
Reasons include owning a PowerPC Mac and incompatible hardware. The Guardian's Charles Arthur reports that he finally got a definitive answer from Apple on the issue of upgrading directly from OS X 10.4 "Tiger" to OS X 10.6 "Snow Leopard" without first purchasing OS X 10.5 "Leopard". A big part of the issue is that buying and installing OS X 10.5 is no longer an option since Apple stopped selling Leopard about a month ago and instead offers Tiger owners the £129 "Mac Box Set" compared with the Snow Leopard upgrade disks that sell for £25. Arthur cites Alan Eyzaguire, director of software product marketing at Apple Europe (and Middle East and Africa) acknowledging that "technically" Tiger users can in fact just buy the upgrade disk and install Snow Leopard onto an Intel-based Mac running Tiger, but adding that doing so breaks the end user licence agreement (EULA) and the boilerplate proviso that "We think Apple customers would like to benefit from the best software that there is, and we think that's offered by iLife 09 and iWork 09." "If you happened to follow along with my guide to building a Hackintosh with Snow Leopard, start to finish, you may be curious as to whether you need to do anything special to upgrade to yesterday's Snow Leopard 10.6.1 release. In short: You don't. Just upgrade like normal; your Hackintosh should handle it like a charm. (Mine did.)" This download includes the latest HP printing and scanning software for Snow Leopard. System requirements: Requires Mac OS X v10.6.1 or later. "For 10.6 Snow Leopard there is a special beta version here which should fix most bugs introduced in Snow (and some others as well as being generally faster) but please note that there are no localisations included." "Is Apple (AAPL) about to unveil updated Macs? Perhaps more exciting for us Mac laptop fans is that Wedge also expects more price cuts as a foil to competition from PCs based on the imminent Windows 7 and the booming netbook segment. Link: Apple: New Macs Coming Soon? "If you really care about digital photos, and can't bear to use iPhoto, your choices range from a folder buried deep in your Mac's Documents folder, or Apple's Aperture, or Adobe's Lightroom. Sure, there are a couple of other alternatives to managing a lot of photos on a Mac (or a PC), but give me a list that's topped by a household name. And free. There's only one . . . Kodak's EasyShare is an alternative, a free alternative to iPhoto." SlashGear's Michael Gartenberg says he used to be a total Macintosh user, but over time, places he worked depended on Microsoft Windows and other Microsoft technologies, obliging him to use Windows for much of what he does. However, he notes that recently Apple has created machines that more closely match his laptop needs, making for a very compelling argument to use a Mac full time. Since "Snow Leopard" pounced, Gartenberg has set aside his PC and switched to using a Mac full time, settling on a 13.3" MacBook Pro since he found the 15.4" MacBook Pro a little too big to travel with and the MacBook Air a little too underpowered for his needs. He has both Windows XP and Windows 7 installed under VMWare Fusion, but says he finds little need for either of them. PR: As students head to school this fall, many are choosing Macs for their academic and recreational computing, with more than one-third of respondents (36%) in a survey of full-time undergraduates at four-year US colleges and universities indicating they plan to purchase a Mac. However, a significant number of student Mac users still want to be able to run Windows or PC-based applications, for example for a specific course element such as AutoCAD for engineering or architecture degrees, and many solve this problem with Parallels Desktop for Mac. "When I started at UCSC, I got a MacBook (which I've named Charlie) and looking around campus it's pretty obvious that lots of other students are opting for Macs now too," said Tim Deal, a sophomore attending the University of California, Santa Cruz. "A year later, I've learned all about the cool things I can do with my Mac, but I still want Windows so I can use Microsoft Office and play PC games. Parallels Desktop for Mac basically gives me the best of both worlds so I can get the ease of use, security, and functionality of the Mac, without missing out on the applications I need for school assignments." To celebrate its collegiate user community, this month Parallels is launching a competition asking students to help it go "back to school". A flyer of the Parallels logo is available on its new Mac To School blog, and Parallels is inviting students across the US to demonstrate their school spirit by sending in a photograph of themselves and the flyer taken at their favorite spot. All pictures suitable for publishing will be posted on the Mac to School blog and each week the most interesting submission will win a goodie bag. The competition runs for one month, from September 15th to October 15th, culminating in blog readers voting for the overall winner of the grand prize. To kick the competition off, student blogger Tim Deal photographed himself with the flyer at a rock concert in Seattle, Washington. Tim started blogging for Parallels as he prepared to head back to UCSC, reflecting on his experiences of his first year and looking forward to the year ahead. Mac to School includes a number of features, from free music downloads to Tim's own musings, and invites contributions from other student bloggers and commentators. To get involved in the blog or enter the picture competition, email Tim at tdeal (at) parallels (dot) com. For students interested in learning more about Parallels Desktop for Mac, the solution is available at a 50% student discount in campus bookstores nationwide or on the Parallels website. Parallels also offers a product specifically for new Mac users: Parallels Desktop Switch to Mac edition, which includes tools for learning how to use the Mac, and an intelligent moving kit to transfer files and applications to the Mac. PR: WD has introduced its smaller, smarter and more secure My Passport Essential and My Passport for Mac ultraportable external hard drives featuring WD's new WD SmartWare software and equipped with hardware-based encryption. The new My Passport drives are more than 20 percent smaller than the previous generation My Passport. The new portable drives with WD SmartWare software visually present consumers' data in a control center, providing them peace of mind that their precious photos, videos and files are securely protected. Available now at select retailers and the WD online store, the new My Passport Essential and My Passport for Mac drives are offered in capacities ranging from 320 GB to 1 TB and come in a range of colors including Pacific Blue, Real Red, Cool Silver and Midnight Black. According to research firm Parks Associates, the average US broadband household currently has over 120 gigabytes (GB) of digital media and files, which is expected to grow to over 1 terabyte (TB) of data by 2013. And while 70 percent of consumers back up their content, the majority of these people are using manual, cumbersome methods such as copying and pasting to multiple CDs and DVDs, and less than 18 percent use software that automatically and continuously backs up their content. "The smaller and sleeker design of WD's redesigned My Passport drives, combined with the intuitive visual backup experience of WD SmartWare software, makes this drive a smart and secure, travel-friendly storage choice," said Dale Pistilli, vice president of marketing for WD's branded products group. "These ultraportable drives are a stylish and spacious storage solution for consumers to confidently backup, store and carry their entire digital lives." WD My Passport Essential hard drives are designed for Windows-based PCs while WD My Passport for Mac drives are formatted for Mac computers and are compatible with Apple Time Machine, Apple's integrated backup solution. WD SmartWare works on Windows PCs and Mac computers and offers a seamlessly integrated option for Mac users who want an alternative to Time Machine or Mac OS 10.4 users who don't have Time Machine compatibility. The new My Passport Essential drives are offered in capacities of 320 GB, 500 GB, and 640 GB; My Passport Essential SE drives are offered in capacities of 750 GB and 1 TB. 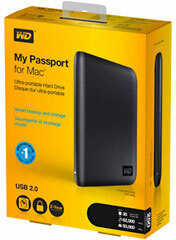 My Passport for Mac drives are available with 320 GB and 500 GB. My Passport Essential and My Passport for Mac drives are available now at select retailers and online. MSRP ranges from $109.99 to $249.99 depending on model. 320 GB My Book for Mac currently available for purchase from Amazon.com for $69.95 shipped (newest version, $99.99 shipped), J&R Computer for $79.99 shipped, NewEgg for $79.99 + $1.99 shipping, Tech Depot at $93.95 + shipping. 500 GB My Book for Mac currently available for purchase from Amazon.com for $104.40 shipped (newest version, $139.99 shipped), J&R Computer for $109.99 shipped, NewEgg for $79.99 + $1.99 shipping. PR: Formatted for Mac, this elegant, external hard drive now features a new, smart, visual backup solution that protects your data automatically and is compatible with Apple Time Machine this drive is plug-and-play ready for Mac computer users. 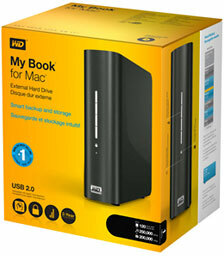 The My Book external drive is an elegant, high-capacity storage solution for all the chapters of your digital life. The latest edition, formatted for Mac, now features visual, easy-to-use, automatic, continuous backup software and drive lock security protection. At last, beauty, brains, and simplicity together. Smaller, sleeker, more streamlined design - smaller, sleeker, and more elegant. As always, this book-like shape takes up minimal space on your desk and allows two or more My Book drives to nestle neatly together like volumes on a shelf. See your backup as it happens - Seeing is believing. Visual backup displays your content in categories and shows the progress of your backup. Power miser - My Book external drives are designed to save energy. 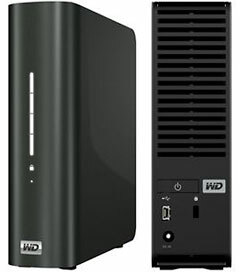 WD GreenPower Technology™ lowers internal drive power consumption by up to 30%, a sleep mode reduces power during idle times, and a power-saving feature turns the drive on and off with your computer. WD SmartWare software is a visual control center with a single screen view of all your data. From it you can back up, retrieve, and secure your files. 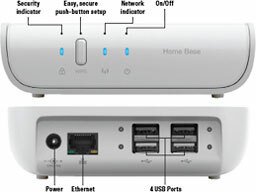 Password protection: An extra level of security with password protection and 256-bit hardware-based encryption. 1 TB My Book for Mac currently available for purchase from Amazon.com for $107.95 shipped, J&R Computer at $109.99 shipped. 2 TB My Book for Mac currently available for purchase from NewEgg for $189.99 + $1.99 shipping, Amazon.com for $191.98 shipped, OnSale.com at $191.99 + shipping. 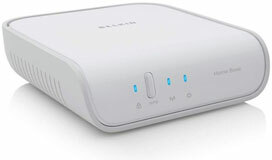 PR: Belkin's Home Base allows anyone on your network to wirelessly share external hard drives, printers, or other devices - wherever and whenever. Data-transfer rates do not support some high-speed/high-bandwidth USB devices such as HD-streaming webcams or other video-transfer applications. PR: USB Overdrive 3.0 is finally here! The new version is smarter, faster, more powerful and easier to use. It supports the new 64-bit kernel in Snow Leopard and comes with a much better user interface. The USB Overdrive now includes support for media buttons on most USB keyboards and talks to many additional input devices that were previously not handled. It still supports all compliant mice, trackballs, trackpads, joysticks, gamepads and other gaming devices from any vendor. Old settings from version 10.4.8 cannot be imported to the new version. I am really sorry about this, but the old settings were handled by legacy code that is no longer supported in 64-bit. The good news is that this will never happen again, as you can now import and export settings at will. Specific support for noncompliant buttons on some devices has not yet been restored in the new version. I'll do my best to add it back as soon as possible. 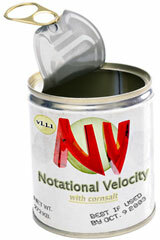 PR: Notational Velocity is an application that stores and retrieves notes. It is an attempt to loosen the mental blockages to recording information and to scrape away the tartar of convention that handicaps its retrieval. The solution is by nature nonconformist. Searching for notes is not a separate action; rather, it is the primary interface. Searching encompasses all notes' content and occurs instantly with each key pressed. All content is compressed and encrypted (enabled optionally) before it is recorded to disk. There is no manual "saving" in Notational Velocity; all modifications take effect immediately. The source code to Notational Velocity is distributed under a modified BSD license and is currently hosted on github. Contributors and collaborators are welcome! The same area is used both for creating notes and searching. 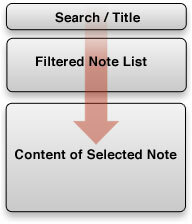 I.e., in the process of entering the title for a new note, related notes appear below, letting users file information there if they choose. Likewise, if a search reveals nothing, one need simply press return to create a note with the appropriate title. If a note's title starts with the search term(s), that title will be "autocompleted". This selects the note and consequently displays it. Correspondingly, selecting a note places its title in the search area (Deselecting the note restores the search terms). To create a new note, just type its title and press return. Edit the note as needed in the bottom pane. To view or edit an existing note, type one or more words contained in its body or title. Reveal a note's content by using the up/down arrow keys to select it. To make good use of NV, try to maintain one detail/fact/item per note. Notational Velocity's strength, note-filtering, is diminished when only a few notes contain most of the content in the database. Body: Buy box of Arm & Hammer raw cornsalt. Sprinkle on poultry before broiling. Notational Velocity can search thousands of notes at once and works best when information is distributed.